Has your double glazed window suddenly cracked? Water in the glazing causing misted and cloudy units? Rest assured we offer quality window repair and replacement services at a fair cost. Polished Plastics are the leading choice when it comes to UPVC window repairs in the North East. Many people presume that if you have failed double glazing the whole lot needs to be replaced, costing thousands of pounds. However, this is not usually the case. Why You May Need Replacement Sealed Double Glazed Units? Most of these are down to damaged or old seals and require nothing more than a company like us who are experts at resealing windows and glazing repairs. Even if the glass itself is damaged it’s possible to install replacement double glazing units for a fraction of the cost of new windows. In order to understand the problems, we first need to understand how a double-glazed window is constructed. Two panes of glass are placed either side of a layer of gas, which creates a barrier that helps to keep heat in, thereby keeping your home at a consistent temperature and preventing heat loss. These units are then sealed meaning the pressure within the unit is constant, this means the glass is always under slight pressure from the changing pressure of the outside air. Normally, the glass is strong enough to withstand the pressure. However, in some cases, it isn’t– and will implode. Most breakages occur during the winter months when the temperature outside is cold and we compensate by turning the heating up which creates more noticeable differences in the temperature on either side of the glass. Problems with double glazed windows that can cause cracks? Size Large square windows have the lowest risk of suffering breakages and this is because they have greater flexibility, therefore, a small or narrow window will be more likely to be affected by a drastic change in temperature and crack. Making windows involves, cutting glass. However, it is important that these cuts are precise as even a tiny scratch on a pane of glass may create a weak point which can break the unit when exposed to the elements. This risk is increased when the cuts become more complex, for example in bevelled glass panels. We’ve discussed how breakages and cracks occur due to the outside temperature of the glass but the temperature of the gas inside the unit can cause problems too. A double-glazed window made on a hot, humid summer’s day, with low atmospheric pressure will be at greater risk of breaking during the colder months. These problems can be prevented if the glass is strong enough. A thicker sheet of glass can resist pressure much better than a thin one, so if you experience blown double glazing you may wish to choose 6mm glass when choosing double glazing replacement panels to prevent the problem re-occurring. When a vapour or gas changes into a liquid it is called condensation. If a surface such as a glass double glazing unit reaches “dew point” (the temperature at which air needs to be cooled to become saturated) any vapour present will condense and produce water droplets resulting in misted double glazed units. Condensation in sealed window units can also occur if the surrounding plasterwork or brickwork is damp or drying out after the completion of construction work. Misted double glazing repairs are a cost-effective solution to replacing the windows. On poor-quality double-glazed units, the seal may deteriorate over time allowing water and moisture to seep into the frame and unit, resulting in cloudy double glazed windows. If the seal has failed or the desiccant inside become saturated with water, you will be wasting a lot of energy trying to keep your home warm and that in itself, justifies replacement double glazed units’ prices. Double Glazed Window Repair Cost? If you compare the cost of resealing double glazed windows and replacement double-glazed glass to installing new windows we think you will be pleasantly surprised with the average cost of fixing double glazed windows, which is usually less than half the price. Of course, this depends on each individual project and our team of experts will be happy to discuss the best and most cost-effective UPVC window repairs. Save money on heating costs, you can lose up to 20% of heat through your windows make sure it’s not more by replacing your failed double glazing NOW! If sealed double glazing units are damaged they are not fit for purpose double glazed window repair ensures they are secure and a deterrent to burglars while also cutting down on noise pollution. Why waste thousands on new windows when it's just the glass or seals that need replacing. We provide a range of services for customers wanting double glazed window repairs, not only are we glass suppliers we also provide UPVC door seal replacement as well as fixing locks and hinges and cleaning all UPVC including conservatories to keep your property looking good for longer. Established for over a decade Polished Plastics carry out work across the north east of England, for both domestic and commercial clients, who have returned to us time and time again. 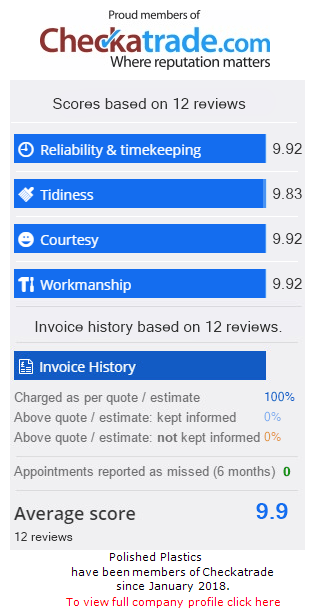 We are proud of our reputation as one of the leading UPVC restoration and cleaning companies, focusing on customer satisfaction, professionalism, competitive prices, and cleanliness. We get the job done, fast! Our friendly team of fully trained experts are always willing to offer advice and discuss your requirements. We offer a very quick and clean installation and all new replacement sealed double glazing units are fully guaranteed.